Home News Apple TV And The Road To Success Or Failure? Apple TV And The Road To Success Or Failure? Over two years have passed since Apple released the latest Apple TV digital media player and a microconsole, which was in a direct competition with Microsoft’s Xbox One and Sony’s PS4 consoles. Many pay-TV subscribers started dumping their cable TV providers in favor of media player players and the Apple TV seemed one of the solutions for streaming films, watching live music directly to a Smart TV. For two years, dust deposited on the third gen Apple TVs and the users couldn’t wait to get their hands on a shiny new “toy”, to replace them. But, is it worth buying the 2015 Apple TV, which will arrive in October? The set-top box is still focusing on gaming, it’s faster, but Apple could have done better, to justify the high price of $149 (32GB variant) and $199 (64GB variant). Why do we need media player streamers? First of all, you will no longer be stuck with a monthly subscription TV service and, sometimes, additional fees are applied for the premium channel add-on packages. No more cables or wires to hide under the carpet, no more annoying channels included in the service plan, which you’ll never watch. A set top box will require an internet service, a fast internet connection, and a TV with a HDMI port. These tiny devices which plug into the HDMI port the TV set have revolutionized television, and Apple contributed to this phenomenon. The first generation of Apple TV was launched in 2007, but it was unveiled a year before as a work-in-progress called iTV. On March 21, 2007, the Apple TV became available worldwide with a 40 GB hard disk, while on May 31 was released a model with four times its capacity. 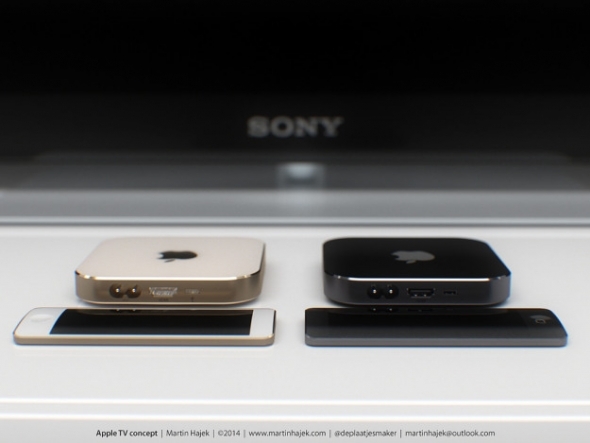 The 2015 Apple TV will be the fourth successor, after it was unveiled on September 9. At the event, the product was presented as the next gen of set-top box, which can be used also as a video-game-enabled microconsole. It will be much cheaper than an Xbox or PlayStation 4 console, but that’s because it won’t be paired with a traditional game controller. Instead, it will be shipped with a simple motion-sensing remote and it will be preloaded with the App Store digital shop. From there, you will be able to download all kinds of games and applications, which were created for this platform, and which, in most cases, have a small price. Apple’s Tim Cook said that “The future of TV is apps”, but it’s more about the games that will be available for the Apple TV. Crossy Road will be an exclusive game which will offer multiplayer mode, and another time-waster which will be played on the Apple TV is Rayman Adventures. If you prefer to enjoy a more console-style experience, then Transistor and Guitar Hero will keep you occupied for a few hours. The platform will receive the latest version of Disney Infinity, which will get close to the full console experience, while Harmonix created Beat Sports also exclusive for the Apple TV. There are many other developers who will release games, but they will announce them later. The Apple TV will come with a new remote control, which will be named the Siri remote and which will have a touch surface and a built-in mic. You will need to charge it using a Lightning cable, and it will last approximately three months until the next charge. The mic can be used to search for content, and there is a Siri button on which you’ll press, then make voice commands. Siri will understand these commands and will find episodes of certain TV shows, or will fast forward a few minutes etc. 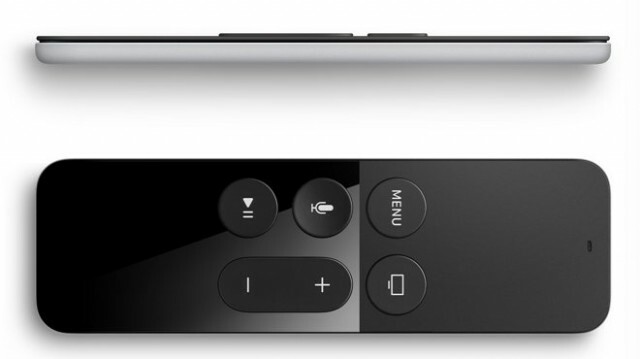 Some of the basic gestures supported by the Apple TV remote control are: swipe to navigate around the interface, tap to make a selection and sweep to navigate through a video. The new interface, which is called tvOS, will have fewer curves and will rely on hard lines. The app icons will be moved around the way you like and you’ll be able to set one of the HD screensavers which were created exclusively for the Apple TV. The device will be 10mm taller than the previous box, having a height of 33mm, but the width and depth are similar: around 10mm. The color will be black, although we heard rumors that it will be available in Silver, Space Grey and Gold shapes. The fourth generation of Apple TV will be powered by a 64-bit A8 chip which will support an internal memory which has been increased from 8GB to 32GB/64GB. Having more room, you’ll be able to install more applications from the App Store. The box has on its back a two-pin power connector, an HDMI 1.4 output, a USB type-C port and a 10/100 Ethernet port. Currently, the Apple TV isn’t 4K enabled, but it’s 4K capable, so this is a big minus.